When conjuring the image of a quintessential New England town, the mind’s eye visualizes an ancient town center with colonial homes surrounded by rolling hills and fields peppered with herds of cattle. The town Simsbury, which was developed during the first two hundred years of its existence by the simple necessities of colonial settlers, is the quintessential New England town. The town selectmen required regions for homes to be built, a common center district for shared use, and ample land for farming. Founding men of colonial settlements wrote and held deeds that eventually created the spaces needed for homes and farmland. 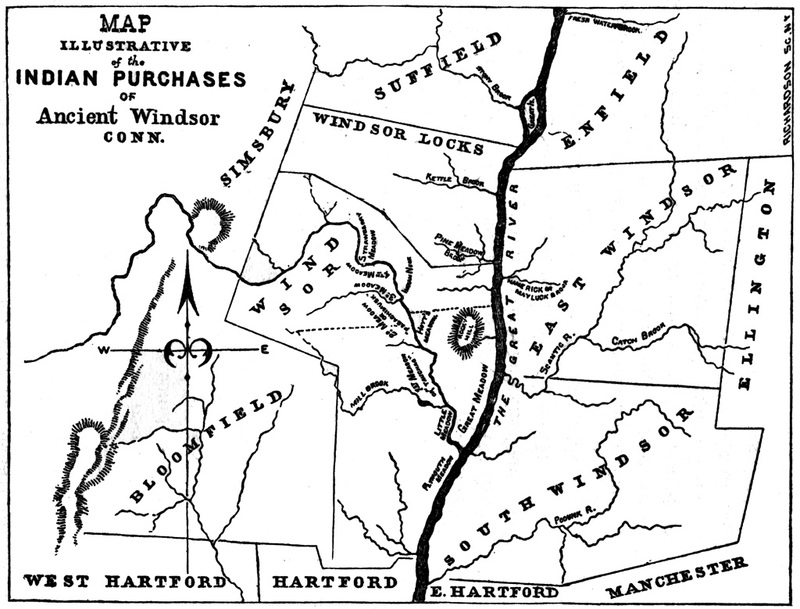 Land deeds, covenants and leases were crucial, because for them, “the life of a colonial community was…wrapped up in the ownership of land and where the fruit of the land and wealth of the forest and river and mine was necessary to the prosperity of their generations and their future generations.” The Simsbury forefathers’ mindset drove them to establish land titles and boundaries that were reflective of their social and legal standards. John Case, among other fellow settlers to the region in 1669, made sure the deeds to his lands were secure and recorded by the General Court. In the early days of the town’s history the Case family, the descendants of founder and constable John Case, held and purchased land in greater proportions than other families in the town. It is possible that the land covenants by the founders of Simsbury established a legacy of land obsession and therefore created a tradition of land ownership expansion in the Case name that followed descendants. The Case family of colonial Simsbury, and the later surrounding towns of West Simsbury and Canton, kept land in the family from the pre-Revolutionary era through the Jacksonian era by intermarrying and by acquiring more land at regular intervals. The land purchases made in 1637 by settlers to the region. An interesting example of the seriousness with which the Case family undertook dealing with land began with an 1840 land lease from a son to his father and witnessed by Justin Case and Newtown Case. In 1842 attorney William Sally wrote a letter, enclosed with a lease, to Jeffery Phelps (Case) in the hope of nullifying a land deal from only a few years prior in which Jesse Case Jr. had deeded land to his father, Jesse Case and his lovely wife Lydia, for use for the rest of their lives. Yet, when Jesse Case passed away leaving behind his widow, the tables turned. The attorney explained that Jesse Jr. claimed that the lease was only to his father for the rest of his natural life but not for the widow. Although the widow previously had been described in the deed with glowing terms, she was being removed from the property by her step-son. The letter went on to call for discretion from one professional to another as they work out what action to take. The author even mentioned that attention should be given to the additional counter claim that the widow’s daughter, Fanny Church, should receive eighteen dollars to settle account books debts that her late step-father left. The discretion was needed since Mrs. Fanny had been visited by the local Commissioner who was pretending to want further information on the situation from her. The dramatic ejection of the widow and her daughter was not settled in the letter, but it surely opened the subject of land control in the Case family. What was it that triggered the claim and counterclaim? Perhaps there were poor sentiments between Jesse Jr. and his father’s second wife. One possibility was that the family feared the widow or her daughter would marry outside the Case family and take the land with them. Jesse Case Senior was a Case with a bloodline of descent from Joseph Case and lived out his final years in West Simsbury, where the claim centered around, but Jesse Jr. had remained on the paternal homestead in the “Farms District” until his death. For over a century, Cases had married Cases, keeping land in the family. 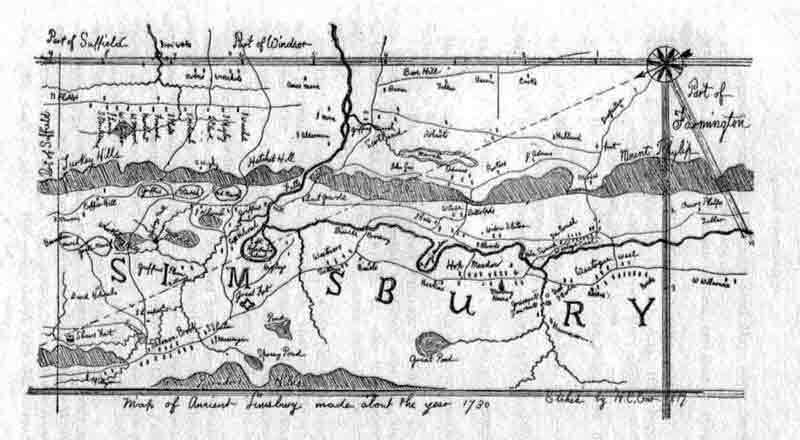 Map of Connecticut 1797 showing the border with Simsbury. The land spat between Jesse Case Jr. and his father’s widow may have been deeply personal, but it is realistic that hindering a woman’s power of control over land ownership was not uncommon in in the Case family. The nineteenth-century land dispute was not the first; since before the Revolution, Cases had been vigorous in fighting for their land. Joel Case, who lived on Case farm from 1746 until his death in 1780, gave to his wife, Chloe, half of his entire land and homestead in his will. The stipulation for such land control was that she had to remain as Joel’s widow for the rest of her life and never remarry. Such a requirement varies from the complete removal of land from Lydia Case, but indicates land ownership was taken so seriously that measure were taken to keep the line of ownership directly in the Case family. Legal means were certainly not the only way that the Case family held on to the founder’s concept of land and power. While the land deed records do not exist for Amos Case, who moved to West Simsbury in 1740, it is known that he lived on East Hill and the house he built belonged to a direct descendant of his, Myron Case, by 1856. The only two daughters of Amos Case went on to each marry two brothers, the sons of Richard Case. This mattered because Richard Case was a grandson of the family progenitor, the original John Case. The legacy of land ownership stayed with the Case family because of the colonial founder’s legacy. By no means was the family working as one unit in all decisions to acquire or hoard property, but the various related branches certainly had similar goals of land acquisition. More likely, this was due to a tradition carried on based on a pattern of marriage and behavior handed down through two hundred years of collective memory and practice. 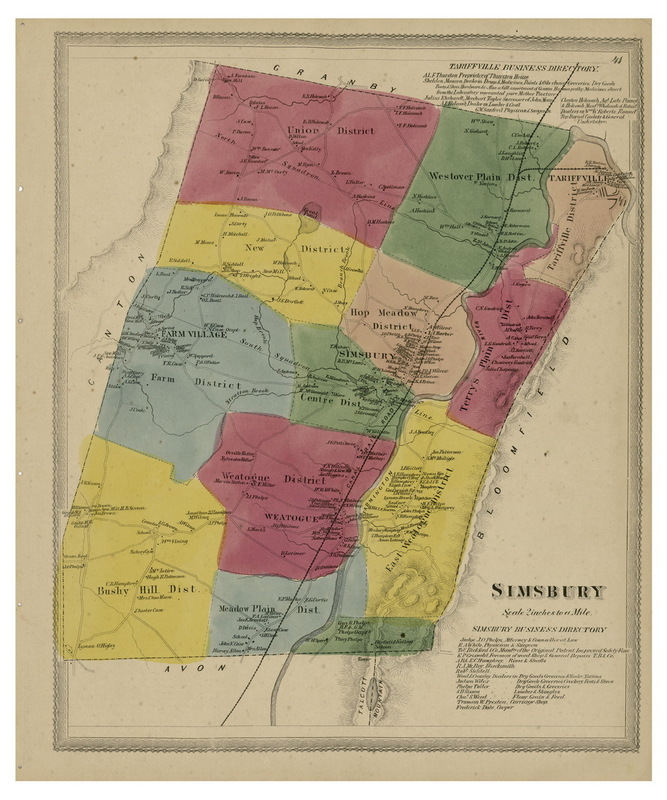 The districts of Simsbury in 1869 reflected the regions established during the settlement of the town. Is there a way I can find out who lived in a home I am looking at buying? It is 56 winthrop st in simsbury. Thanks. 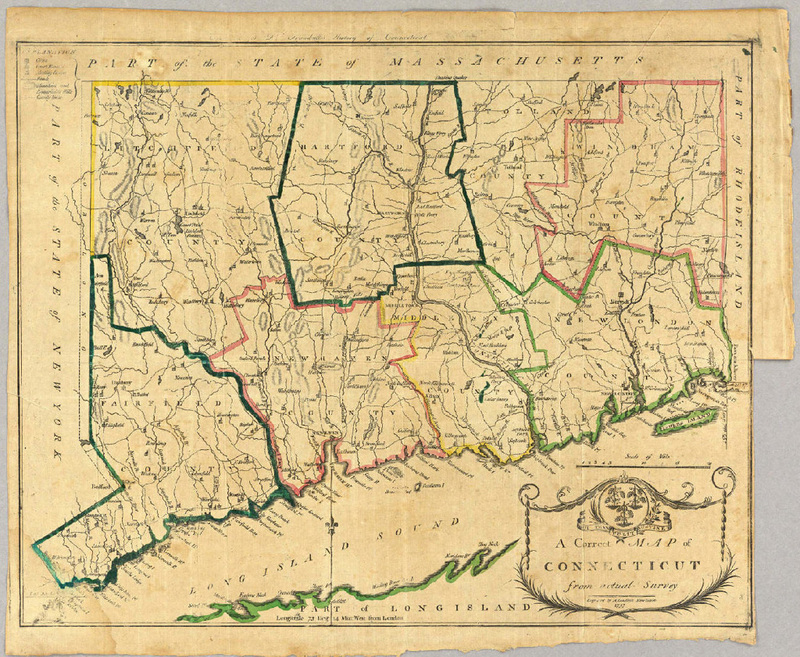 Land records are kept in the Connecticut State Library and in the town halls. The indexing is by grantor-grantee, but it’s not too difficult to work your way back. The town clerks are very knowledgeable.